HE INSIDE OF my Buff smells like socks. Five days into a Mexican flats fishing trip, with only the local graywater to wash clothes in, things start getting a little funky. You notice stuff like this during your seventh hour of standing on a flats boat, like a statue, musing over whether the permit your guide says he saw forty-five minutes ago was just polite fiction. They do tell you that permit fishing is hard. By “they” I mostly mean all the anglers who come home without one—a legion of pro bono PR reps for the most difficult of marquee gamefish. Anglers who figure out how to catch them—not one, but many—leave a wake of whispers behind them. Usually the whisperers simply state a number, then give each other a knowing glance. “Ninety-three,” they said of one grizzled septuagenarian at our lodge, in the tone you’d use to tell your buddy that Jeter was sitting in the booth behind him. Thirty-seven enemy planes downed. Twelve hostages extracted. A million dollars in twelve minutes on the exchange. All said with the same reverence. My life permit count was zero. I could see the numeral floating over my head like an LED sign. I’m pretty sure my guide, Tomas Hernandez, could see it too. I made a point of learning Tomas’s last name. A lot of anglers don’t; they know their guide the same way they know the babysitter their wife hired: “Holly” is a sixteen year old scratching up money for her first car payment. Tomas Hernandez is a thirty year veteran of the permit wars; a time-tested master sergeant who’s pulled more than one green-as-grass lieutenant out of the fire. It seems like a guy like that ought to be known by his last name, too. Tomas may have been a quality guide, but he wasn’t a weather god. For the fifth day in a row, the wind threatened to stay at 15 knots. Worse, the tide was out, draining the flats of the deeper water that tall-bodied permit need to feel comfortable. I’ve actually watched permit feed up close, while snorkeling at a resort not far north of the flats we were drifting across. The most interesting thing about sitting on the bottom in a pod of feeding permit is the racket they make. They pick up crabs and unidentified things off the bottom, then munch munch munch, they crush them up in their rubbery, carp-like mouths. Even though they feed much like bonefish, physiologically, they have to stay in deeper water if they want to remain wet. 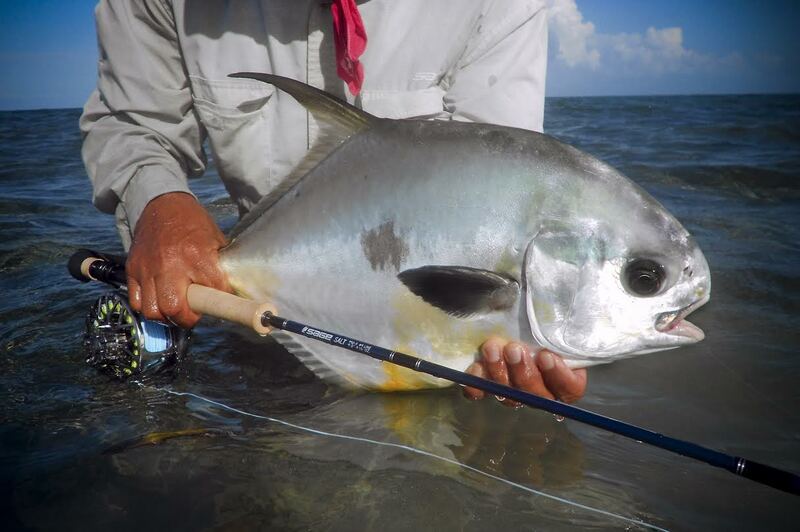 And so, more often than not, a permit flat is four to six feet deep rather than a wadeable two or three like a bonefish flat. Add in turtlegrass, strands of errant sea foam, the persistent wind, and even a quasi-omniscient guide can look a little bewildered. The day before, we had taken a break from the wind and our fruitless permit quest, deciding to focus on tarpon instead. A lot of guides will take their anglers a short distance into the mangroves to see about putting one leg on a Grand Slam—a high accomplishment for all real saltwater anglers. Ours was a large group, however, and the lodge host decided to mount a special expedition. An hour of open water followed by two and a half hours of machete-hacking, boat-dragging jungle later, we found ourselves on the promised tarpon lagoon. It was thick with mud from the morning’s rain storms. We spotted no tarpon. Our consolation prize was a Mayan ruin, Punta Tupac, deep on the southern border of the Sian Ka’an natural preserve on Ascension Bay. Inside, it was dark and cool and full of bats. The sun was taking on color as it fell, and it was time for Tomas to play his ace in the hole. We staked out on a bed of turtlegrass, almost in sight of the lodge. Three small permit the size of softballs flitted by, their backs looking strangely brown against the waving, murky fronds. They were on us and past us before we could react; Tomas just nodded, looking satisfied. Here there be permit, guy. Saddle up. Sometimes, after a long week on the water, it can be hard to gather the necessary focus to put everything together. The wind was still cracking along, knocking the crest off waves just outside the edge of the turtlegrass. We were slightly sheltered from the gale, but I was still sunburnt, and chafed in unmentionable areas, my eyes burning with sunscreen runoff. It was getting late, and I could feel the gravitational pull of the lodge bar over my shoulder. If you’ve ever stumbled onto a deer after a long hike in the deer woods, you’ll understand what happened next. “Eleven o’clock; 70 feet out, guy.” Tomas’s words jolted me awake. “When he gets into range, you make cast.” Sudden, electric, high-definition clarity pulsed through my system as my adrenal gland redlined. I saw the permit, head down in the grass and ambling our way in what was most definitely the non-fiction section of the flat. My line, stretched and carefully wetted and coiled all day, surged off the deck as I made my first cast. “Streep” came the command. I streeped. He ignored my shrimp fly, which had been left behind a few days earlier by a famous Italian fly tyer and lovingly bestowed upon me by the lodge host. Tomas’s voice cracked like a baseball bat breaking: “Change flies. Now. Do not hurry. Make good knot. Use this.” He tossed me a standard crab pattern, twin to three I had purchased in faraway Atlanta. It took an act of supreme willpower to still my shaking hands, but I “made good knot”. My next cast was probably the best of my life. Backhanded, the fly snaked tight and on point toward the fish, about forty feet upwind. “Perfect,” said Tomas. It landed about three feet short, directly in front of the permit, which was now facing us. “Streep” came the command. I streeped. And then I understood. I understood why permit fishermen liken their sport to heroin addiction. Why intelligent men will leave behind businesses and families to obsessively pursue a fish that will give them the finger even in perfect circumstances. The permit’s happy dance suddenly turned into pure kinetic force; his tail surged once and he closed the gap on the fly before my synapses could fire and register what was happening. The fight: the moment of panic when I realized the backing was coming tight to a tangle, then Tomas on the engine, motoring down-flat while I desperately tried to reel in enough line to build a buffer—all these things happened. I even landed the fish and played fashion model for a while. But what mattered was the moment when that permit saw the fly, then surged. That was the needle hitting the main line. That was the start of The Problem. My little LED-counter rolled over with a ping. From a big fat zero, I now had a one. And one, as they say, is the loneliest number. This article originally ran in the January 2015 issue of The Drake. 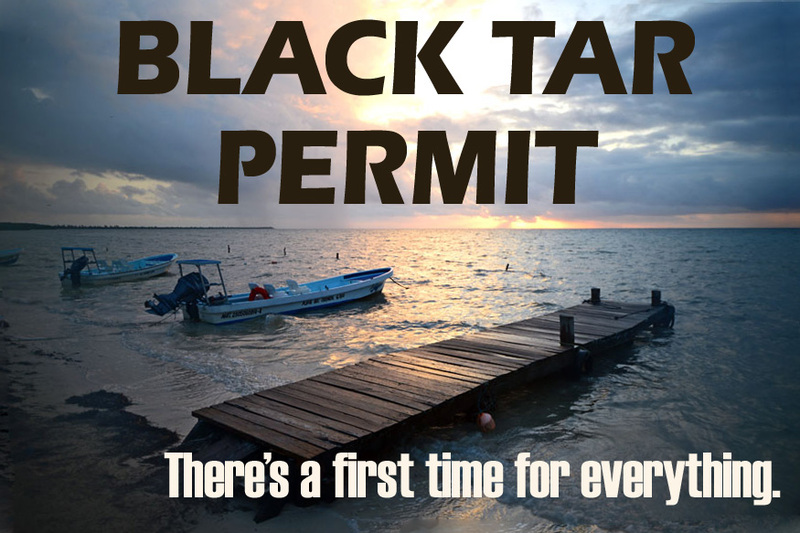 2 Responses to "Black Tar Permit"
They may not be the earth shattering fighters of their grand slam brethren the tarpon, but it’s a toss up for me to choose between chasing tarpon and permit. The high of landing a Permit is only rivaled by big tarpon jumping.